Sneakers that respect both Man and the Environment ? Founded in 2004 in Brasil, Veja was born from the founder's dream to create a new brand, mixing their values and their style : mixing refined design, ecology, fair trade and social cohesion. In ten years of existence, the founders of Veja have brought proof that it is possible to reinvent the way minimalist sneakers are manufactured. 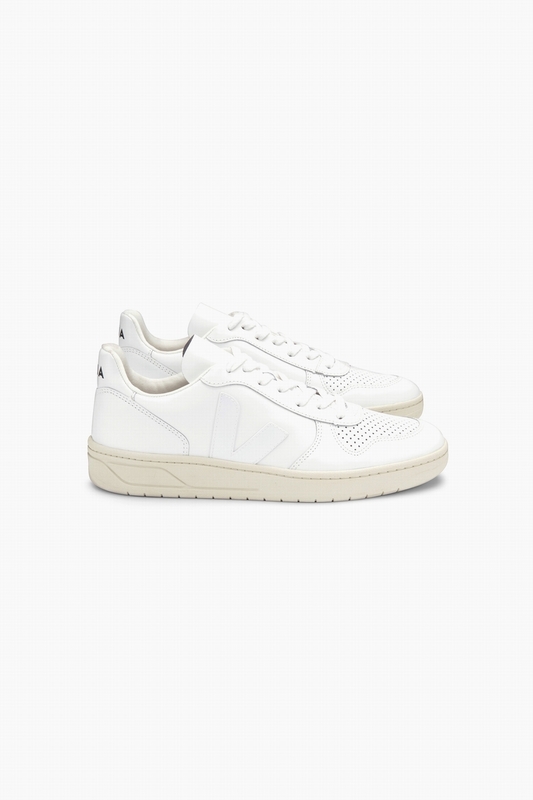 Veja, V-10 Leather Extra White. Free delivery from 60 € for France and over 150 € for international. Free delivery from 60€ of purchase excepted for the furnitures. Free delivery from 150€ of purchase. VAT deducted except European Union. For France and for any not sales articles, the expenses of returns are offered with a prepaid Colissimo label included in your parcel. An exchange is possible while stocks are available. Your refund will be re-credited on your bank account or Paypal used for the payment of the amount of the returned product(s) excluding shipping fees if they were charged to you. Please return your order under 14 days after delivery in the original packaging. A credit note or an exchange is possible for any article returned under 14 days. For products under promotion or on sale, the return is the responsibility of the customer. x3v0k2yz3b1cs - execution time: 0.344 sec.